Images show propagation-based phase-contrast CT of mummified hand. With phase-contrast CT, ancient soft tissues can be imaged in a way that we have never seen before. “Soft-Tissue Imaging in a Human Mummy: Propagation-based Phase-contrast CT.” Collaborating with Romell were William Vågberg, M.Sc., Mikael Romell, M.D., Sofia Häggman, Ph.D., Salima Ikram, Ph.D., and Hans M. Hertz, Ph.D. 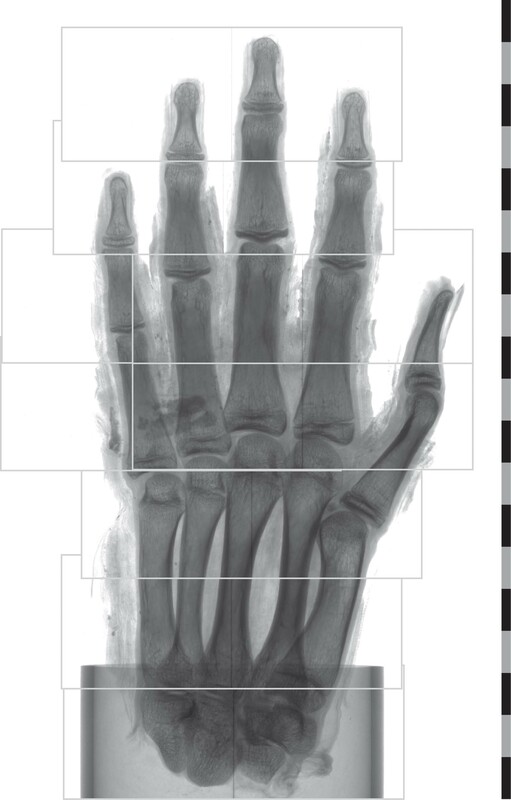 Regions for tomographic scans.For the imaging of the hand, a total of nine tomographic scans were performed. Here, the field of view for each scan is shown. Before tomographic reconstruction, the left regions of the fourth and fifth scan from the bottom were stitched together with their respective right counterpart.